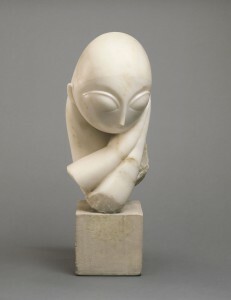 Constantin Brancusi (Romanian-French, 1876–1957), Mlle Pogany I, 1912. White marble; limestone block, 17½ × 9¼ × 9¼ in. (44.5 × 23.4 × 23.4 cm). Philadelphia Museum of Art: Gift of Mrs. Rodolphe Meyer de Schauensee, 1933, 1950-134-163. © 2013 Artists Rights Society (ARS), New York / ADAGP, Paris. The Mlle. Pogany series occupied Brancusi for some twenty years. He carved the first version of this sculpture in marble from memory in 1912, and made casts in bronze and plaster from the original. He carved a second version in marble in 1919 (location unknown), and a third version in marble in 1931 (Philadelphia Museum of Art). Though several stylistic features of the 1912 version reappear in the two subsequent iterations, including the figure’s slender hands and exotically deep-set eyes, the portraits became increasingly abstract. The plaster cast of Mlle. Pogany was offered for sale at the Armory Show for $270, but failed to sell. The American painter Robert W. Chanler hoped to purchase a version carved in marble, but the price was too high. Instead he bought a bronze for $550. Quoted in Sidney Geist, exh. cat., Constantin Brancusi, Edobori Gallery, Osaka, 1989. “At the Art Exhibit. Our Critic’s Impression of the Impressionist’s Show,” New York American, March 2, 1913, Section 4, 3. Charles H. Caffin, “Is She a Lady or an Egg? An Analysis of Expression,” New York American, February 24, 1913, 8.